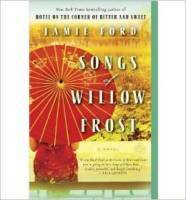 Songs of Willow Frost by Jamie Ford is a book that I doubt I would have chosen on my own to read. I can’t really explain why, but it wasn’t on my radar. I am so glad our book club picked this book. The time is 1934 in Seattle, Washington. Twelve year old William Eng is living at Sacred Heart, an orphanage outside the city. The orphanage chooses one day each year to celebrate all of the children’s birthdays. This year, the nuns have chosen to take the kids to a theater downtown Seattle. A woman comes out on stage to perform and sing. William watches her and recognizes her. Ah-ma he calls her, she is his mother. William has a few trusted friends and when he tells them she is his Ah-ma, they think he is crazy. The story travels back to the beginning. Leading the readers through the tragic life of Liu Song. She is the daughter of a Chinese American couple in the 1920’s. The author does a fantastic job of bringing you into this incredible story. Back in the 1920’s and 1930’s, children had no voice. Chinese American women had no voice and were expected to as they were told. Many of these women were strong, determined and an inner strength. Songs of Willow Frost reveals secrets and lies that have damaged these characters almost beyond repair. The book inspired a lively discussion. We all seemed to agree on how much we loved these characters and felt that we knew them well by the end of the story. Below is a link to take you to several questions for a lively book club discussion. Dinner was served… We had a feast. Our hostess had laid out a beautiful Chinese buffet dinner with beef and chicken dishes. She also offered vegetarian options, rice and chinese salads. All to be eaten with artistically decorated chopsticks that were a gift to each of us. Songs of Willow Frost was a wonderful story and is a great choice for your book club.